Table of events on this page: the other sources listed are shown in white text. 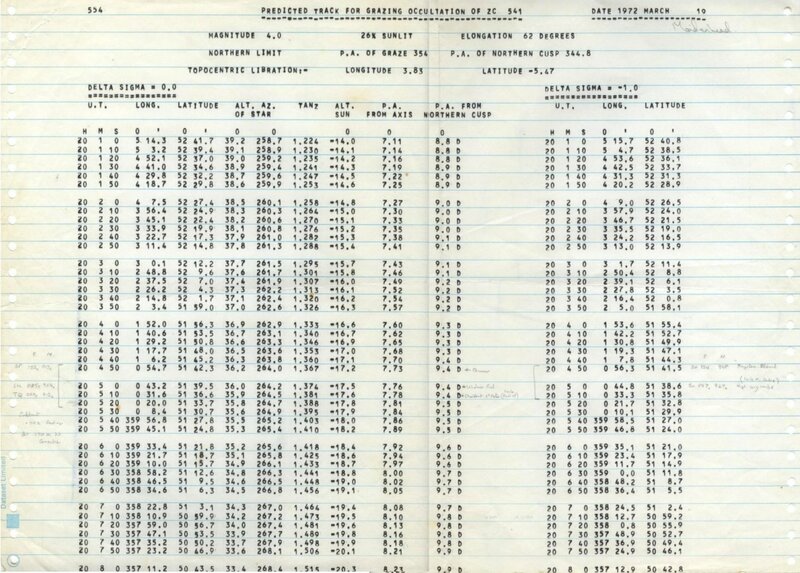 1986-11-22 Lambda Cnc observed by [#Liverpool] A.S.
1991-02-21 ZC 562: bad weather [#Hurstbourne -Tarrant ] organised by A J Elliott. 2014-11-01 SAO145938 observed by [#Loughton] A.S.
Read a list containing planned events effected by weather. 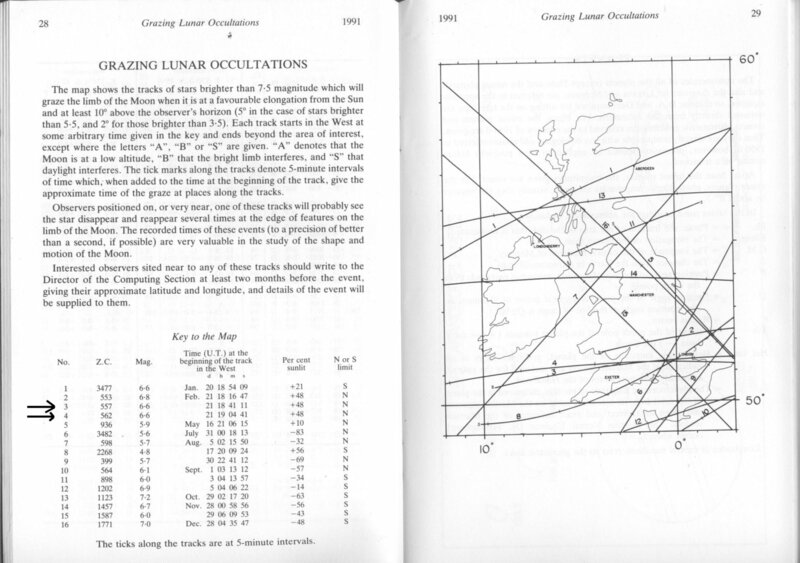 In 1972 an occultation in the Pleiades cluster presented my first opportunity to see a Lunar grazing occultation. The star was 20 Tauri and predicted to graze the Northern cusp of the crescent Moon. An ideal situation suitable for our small telescopes. The Moon in March would also be high in the sky with Earth Shine. 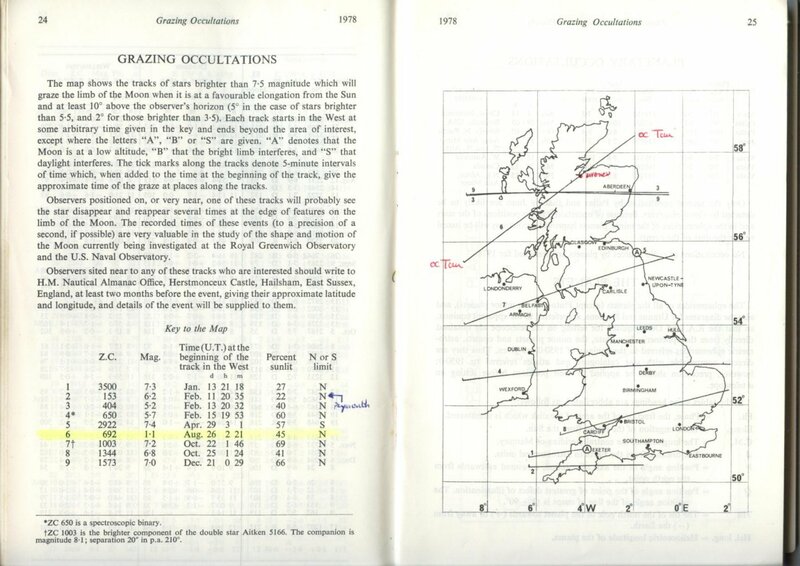 The prediction was published in the 1972 British Astronomical Association Handbook, so I requested the graze details from Gordon Taylor (Computing Section Director), who also worked at HM Nautical Almanac Office (HMNAO). A group off four (myself included) from the Maidenhead Astronomy Group assembled with small refractors, two stopwatches each and I think we must have had tape recorders. All being well we would get a time for the first event and a time when we stopped recording and extrapolate timings in between. "How are we going to start our watches?" We had not planned this, and there was no public telephone box to dial TIM (Speaking clock), so the only option was to knock on a few doors in the hope of finding a helpful resident. We received a few strange looks, and then decided on a more "professional approach". We explained we were about to make some observations of the Moon for the Nautical Almanac Office. This worked, and we started our watches on the PIPS - taking careful notes. I don't know the name of the guy now - but we were most grateful for the use of his telephone. Xi Sag was magnitude 3.6 and would graze the S Cusp along a track from the Isle of White to Suffolk. I knew the road down to Petworth very well, so this was a logical location. The Graze would be at 1747 UT with the Moon 36% illuminated. 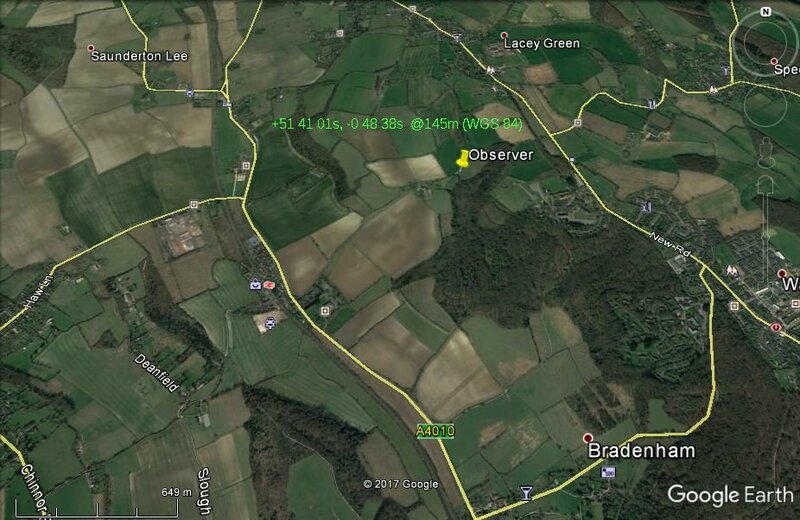 I set up close to a lay by off the A272 identified on the OS map inside the mean limb. The car is an Austin 1100 - my first car given to me by a work colleague for £80. Equipment was: 6" F/8 Alt Az, two stopwatches (rated), one tape recorder and a medium-wave radio tuned to the 6-o-clock news. Both watches would be started at the first ingress. One watch was stopped to time the tape duration, and the other was stopped on the 6pm time signal broadcast. Replaying the tape several times and timing the replay gave a measure of the event times and a time correction to apply. Organiser: Tim Haymes, single position, observer and recorder. 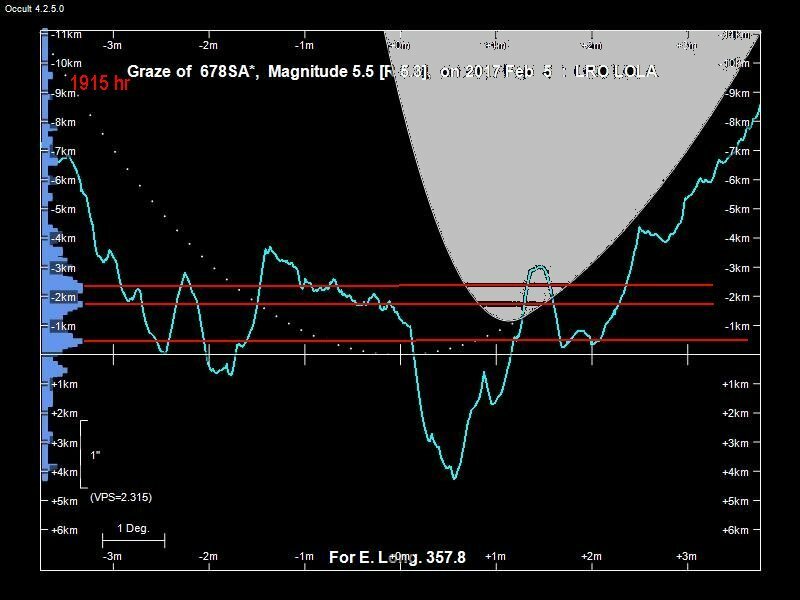 I teamed up with Eddie Moore of Reading A.S. to observe a 6.8 mag star at 79% lunar phase. Eddie hadn't seen a graze so we thought it was worth a shot since it was not too far away. There was a convenient Triangulation Point on Marlow Hill in the graze track. It was also Christmas-Eve and traffic was very light. We stopped at the side of the road and I jumped the low hedge, passing through Eddie's 80mm Refractor. Conditions were hazy, but the observation of one ingress was taken. The star was a bit dim and the O-C suggested the time was taken prior to actual disappearance. I don't recall how the timing was made. It was all slightly unsatisfactory. The Irish Coffee after the event was warming. 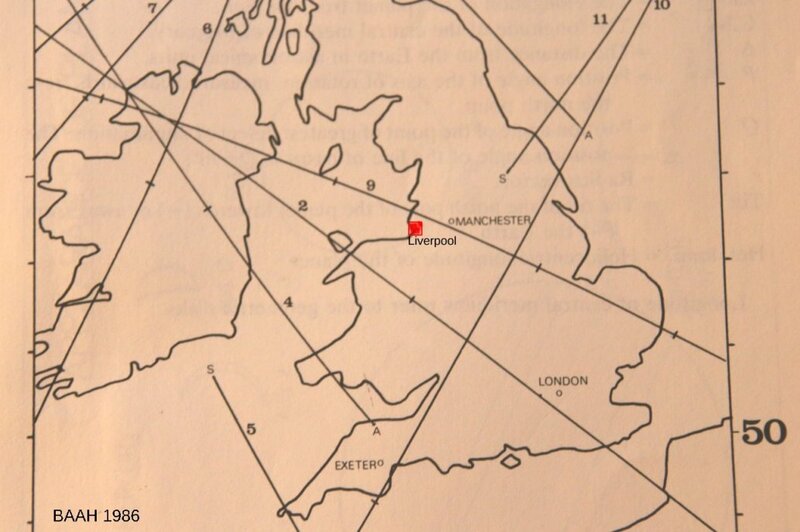 Prediction by H-J Bode......OS map with Trig Point.........1945 Image with Trig Point.............NAO reduction. In 1976 I was completing my last year at University of Salford as a mature student studying Chemistry. I joined the Salford Astronomical Society and used their instruments for occultation work. I also finished a personell project to build an MSF 60 KHz receiver with the help of an electronics degree student Doug Boit who helped tune the circuit. The radio receiver was used at ZC164 occultation. The prediction was computed by H. -J. Bode (IOTA). From memory I think I sourced it from the BAA Lunar Section Director Geoff Amery who had been in contact with the Mr Bode. Goeff was also a member of Reading A.S. with a keen interest in occultations. 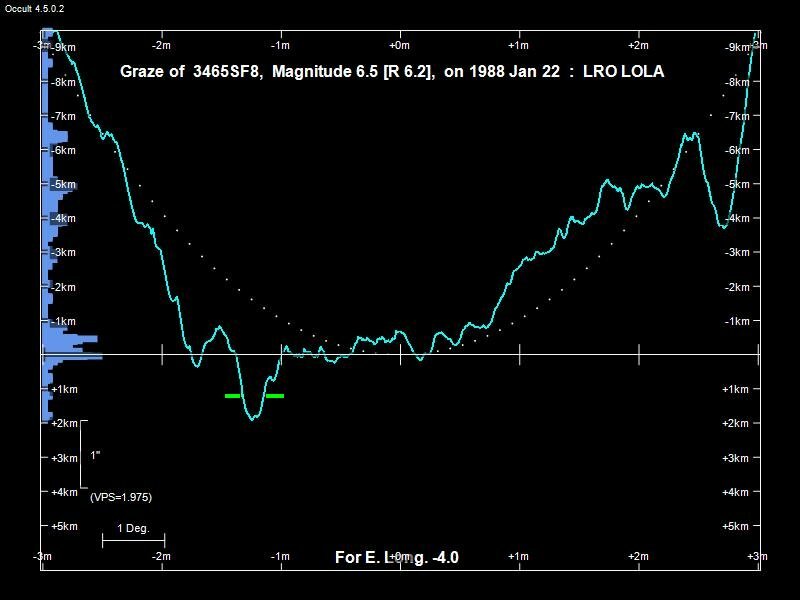 Epsilon Psc is magnitude 4.4 with central graze predicted for 0253 30s UT. The Sun's altitude would be -6.5, so in a pre-dawn twilight sky. The Cusp Angle was also small at -0.6 degrees at the Southern cusp. 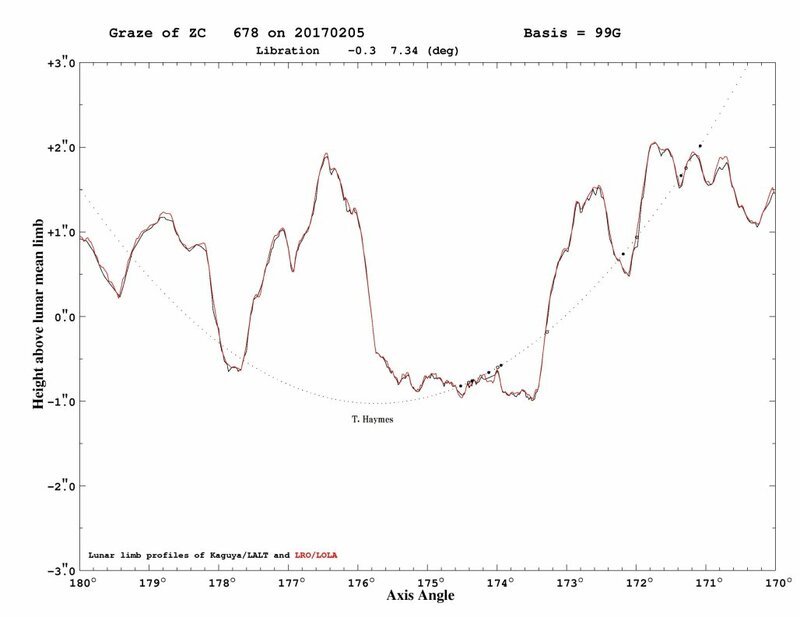 From my observing site near a tree I set up the 6" but failed to find the star in the brightening sky, however I timed an egress on the dark limb at 0253 16.6s (PE 1.0s applied). It was a difficult observation and O-C indicates my timing was LATE. A few days later I surveyed the location and found I was 250m NE of a trig point. This enable me to find the Long and Lat with reasonable certainty. The tree and Trig Point don't appear on modern imagery on Google Earth, but can be seen on the 1945 photographs. Finding Long / Lat. 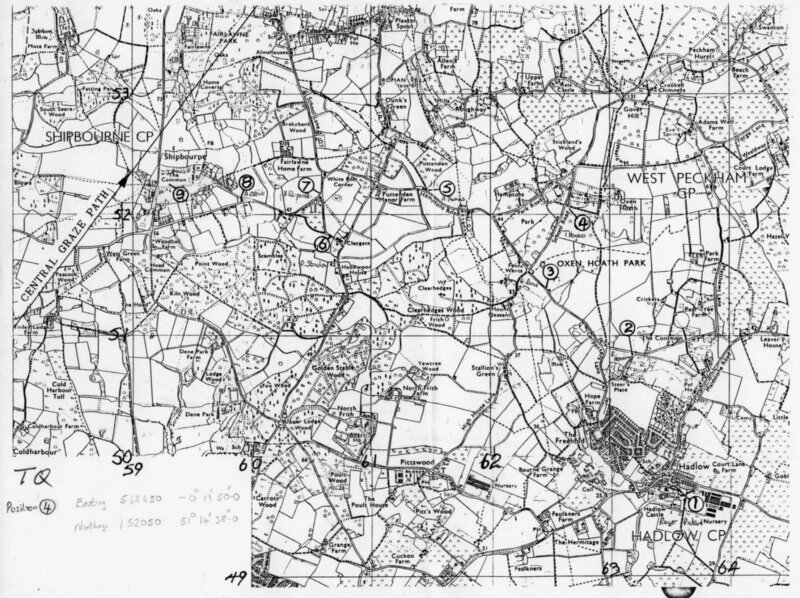 I used reference libraries which allowed either photocopy, tracing, or measurement of large scale maps.The maps provided a grid reference which could be converted to Long and Lat using a BASIC computer program written for ZX81 by G.J.Kirby in J. Brit. astron. Assoc 1982, Vol 92 page 198 [with correction in October]. I adjusted the code to run on other systems (Apple, PC, Cassio). The occultation of 50 Cnc was organised by Geoff Amery( Director, BAA LS) and the Reading AS. A group of Maidenhead members (inc. myself) took up two positions, one single and one double occupancy. There were nine positions in all. An Amateur Radio Club provided secondary standard radio time signals to the stations via some sort of short-range transmitter of a manually keyed time signal. I dont have the detail but it worked. I used my own MSF 60 Hz receiver and submitted 9 events, but on re-examination this should have been 10. One time is missing from the report. (See Limb Profile from Occult4 ). 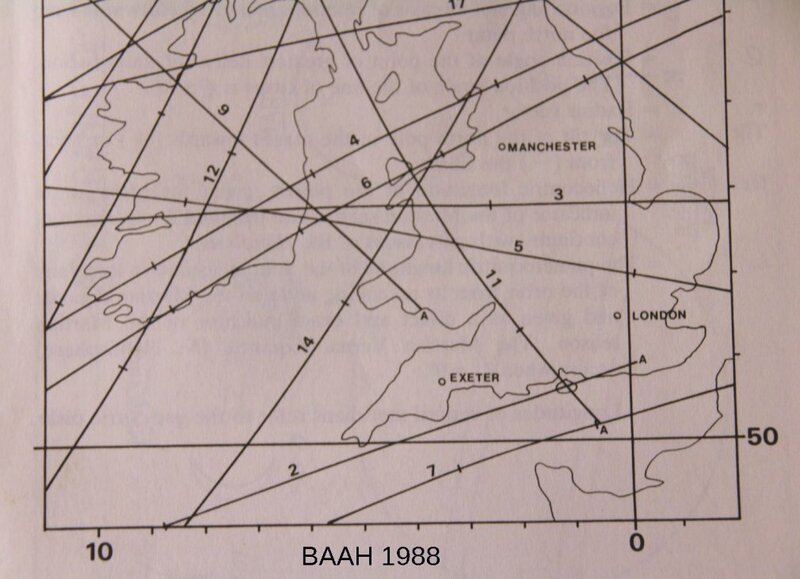 The graze was predicted in the BAAH 1977 (entry no 6), passing NW-SE from N Ireland, through Wales down to the South Coast near Eastbourne. The Moon was 55% sunlit and it was a Northern limit at roughly 2330UT, cusp angle 3.4 degrees. WGS84 ........= -1 13 55.3", +51 15 04.6, 96m ( from Google Earth).......................................+0.01 +/- 0.05" .......10 ? 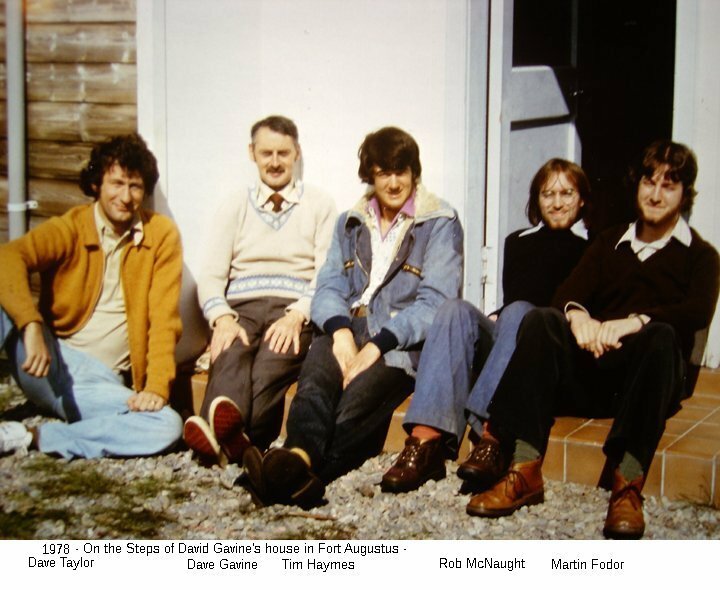 Observers: (T Haymes+D Gavine), D Taylor, R McNaught, M Fodor, (P Ferguson+D Ferguson). A second team observed elsewhere. With confidence we can say this was the "Great Aldebaran graze". The red giant star passed behind the mountain tops on the Northern limb at 0225UT on a clear night with the track passing just North of the Great Glen to Inverness. 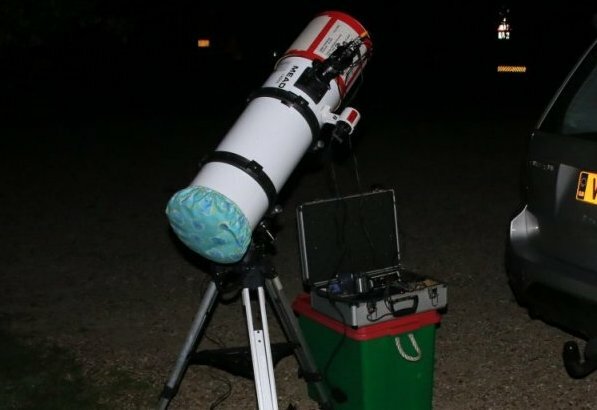 The equipment consisted of my 6" F8 reflector on Alt-Az mount, an 80mm refractor mounted along side ( loaned by Peter Hunt, Bray Nurseries, Berks.) a Kodak Super 8mm Cine camera (also on lone), tape recorder, MSF 60KHz radio receiver (home made), an amplifier, and 100ft of 3-core wire to feed the time signal to a second station. My personal objective was record the graze on film. No one had attempted this before and a lot of planning had gone into this adventure. Several films had already been exposed on bright star disappearances at 18 frames per second on Ektachrome 160ASA. I knew the cine camera would work. It was a simple Kodak "instamatic" type unit with a fixed focus lens which could be attached by the a-focal method. This used an eyepiece in the draw tube focused at infinity and the camera (no focus arrangement) would be brought up the eyepiece. The exit and entrance pupils were a good match. A bracket was made to hold the cine camera at the eyepiece and there was a jubilee clip arrangement to hold the run-button down. The length of film was about 3.5 min total run time. After discussion it was decided that Dave Gavine would be my co-observer using the 80mm (3") refractor. He would be the visual observer at our station. I had a 3" finder on the 6" and I would adjust the Alt-Az to keep the Moon in view while the cine camera was running. When Dave announced the first ingress, I would start the camera. At the same time the tape recorder was recording, and MSF was bleeping one pulse/sec. A wristwatch would be used to identify minute markers. This was a bit hap-hazard (if I recall) since there were no sites pre-identified. However it soon became clear that the Dam across Lock Clounie was a good site. It was straight, with a commanding view to the SE, and relatively short drive away on the A87. When we arrived we had to climb over the low fencing to get access to the Dam which was illuminated by the silvery light of the Moon. Myself, Dave Gavine and Dave Taylor carried out stuff across the Dam wall to a position about 2/3rd the way along. Dave Taylor was 100ft North of us - the length of the wire we brought to feed the audible time signal to him. On the night, radio reception was poor owing to the mountain to the South, but it was good enough. In the Utube recording, listen out for Dave Gavine and our near simultaneous voice announcements, and in the background (100ft away) Dave Taylor calls out events he can see while the star is hidden from us. The time signal is clear and visual timings were reported to RGO. (see graphics above). No times were derived from the film which was used to record fade events. I had originally thought I could introduce a time signal onto the cine film vis an LED in the eyepice, but testing this was unsuccessful. 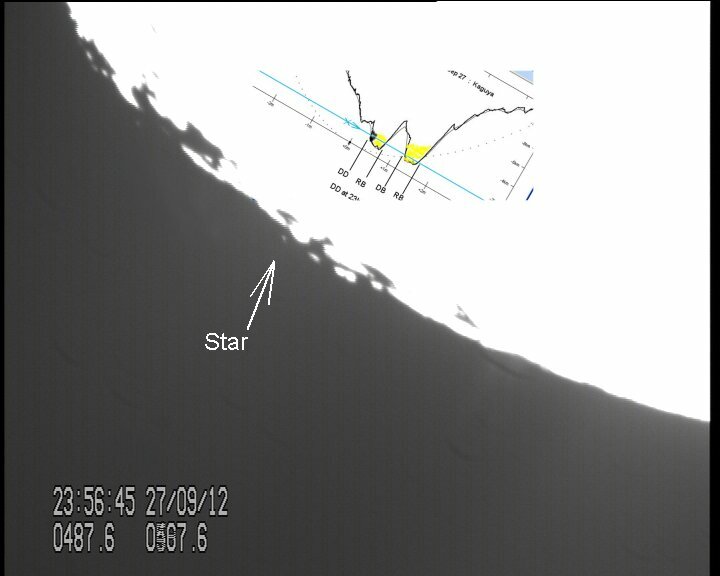 The stations McNaught, Fodor and Ferguson used different timing methods. From what I recall at the Ferguson site, Pat made the observations, while Don was the Recorder - i think using a UT synchronised clock, noting times to 0.5s. I have used the positions in the Occult4 archive and plotted them with Google Earth. There will be a difference of several minutes of arc between the OSGB and WGS84 datum (see graphics above) but it gives the general idea - in fact I didn't know the positions of the other team members until I wrote this page. 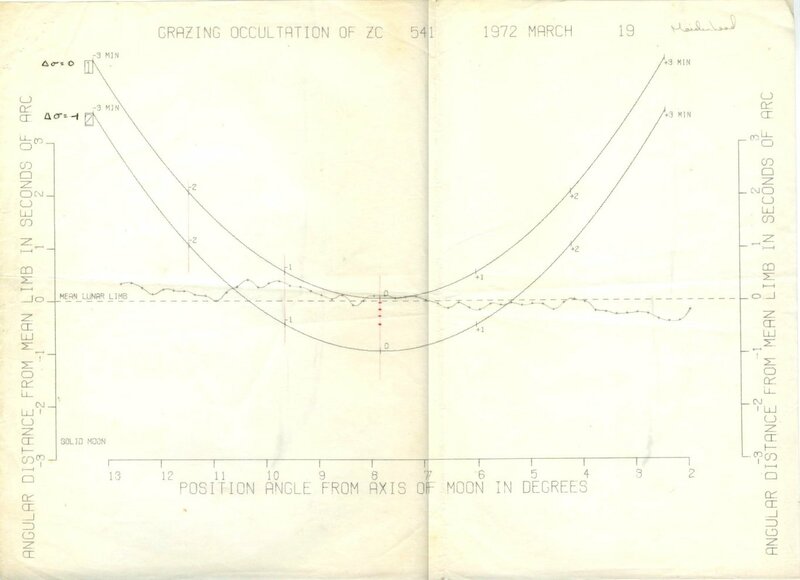 Using Occult 4 and displaying the 1978 timings against the modern LRO-LOLA limb, there is good correspondence. 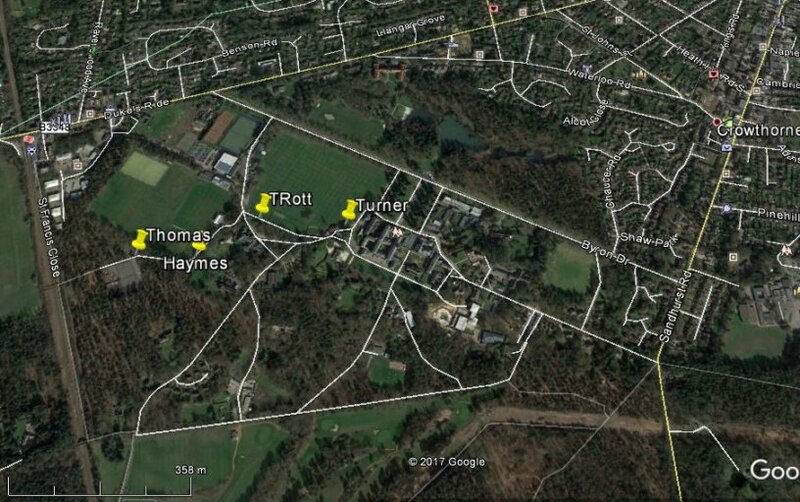 OS Map..................Goole Earth for T.Haymes..Limb profile with jottings......Results P1.......Results P2. This was the first graze track of 1979 in the BAAH. 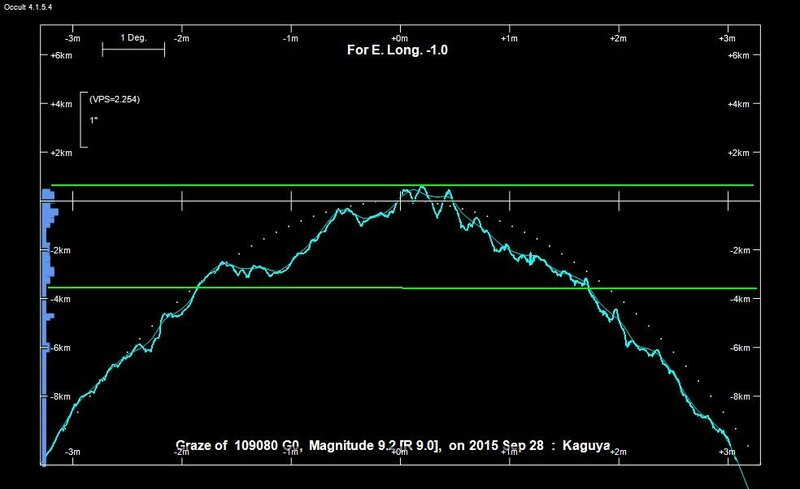 WZ Ceti (mag 6.7) was grazing the Southern Limit of 64% sunlit Moon at 1917UT. Planning was done by Anthony Thomas of Reading AS, and three observers set up to record it: Anthony, Martin Ratcliffe, and myself. There was another team observing nearby. (See the observer list). I was on the Southern limit (with Peter Hunt - 3" Obj) and we recorded just a pair of contacts on the dark side separated by 37 sec. Sunrise was on some high lunar peaks and bright side contacts were not seen. Time keeping was by tape recorder and continuous radio time signal (MSF 60 KHz). 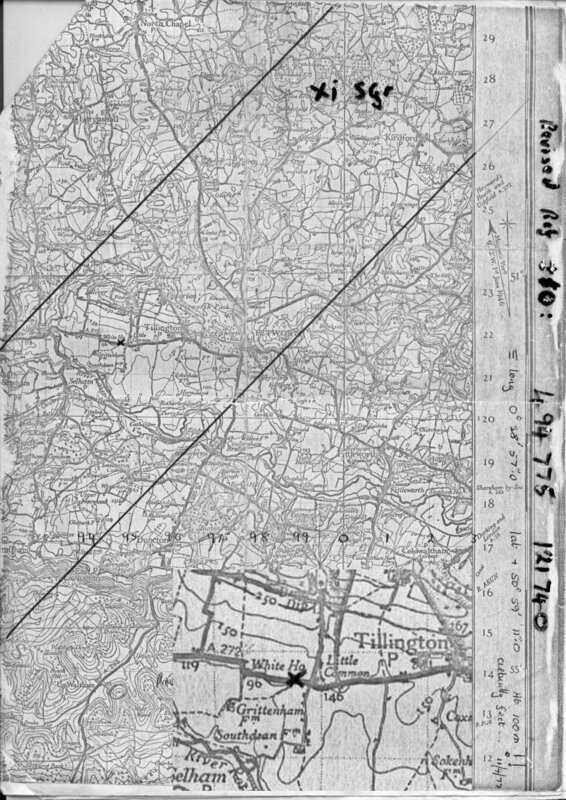 A plot of all the results was issued by RGO which showed a line of contacts passing through the mountain. John Mason in the LSC 1979-05 wrote to say that these seemed to be spurious. In TA issue 1979-02 are two further reports. 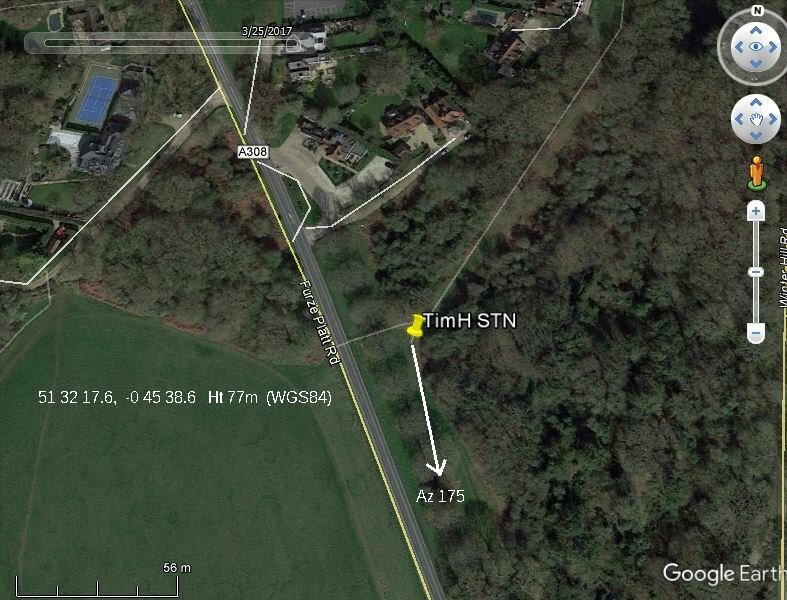 Mr.J.A.Burger from Ewell A.S.(team of 6) observed near Horsham using DIZ radio time signals, and Alan Dowdell (Solant Astronomers) observing near Gosport (team of 4) who used home made MSF 60KHz receivers and tape recorders. This was a continuous time signal at 4525 kHz based at Nauen. Some of the Europe's talest transmitters were built here in East Germany. Observers reported: M Ratcliffe, T Haymes Observers not reporting: ? A second graze in1979 was listed the BAAH. A 6.4 mag star (HIP 29326) at the crescent (21%) Moon with Northern limit. No limb profile was available from Watts. 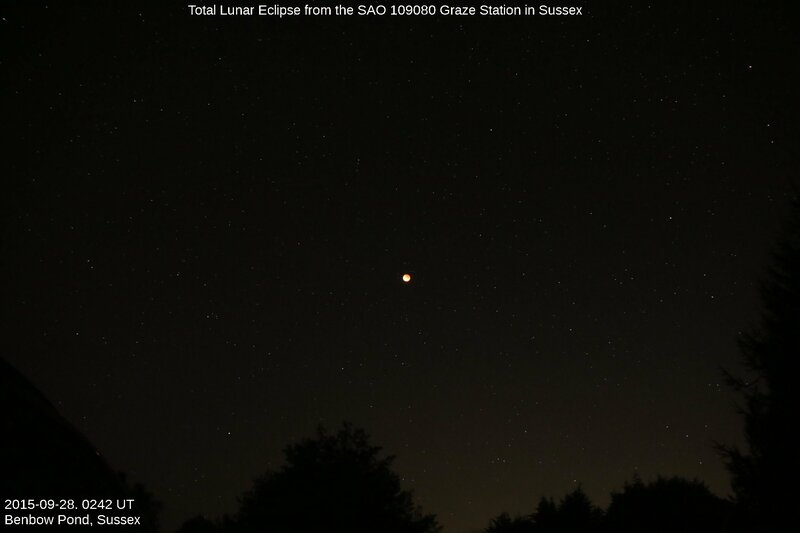 Once again members from Reading, Newbury and Maidenhead Astro Socs teamed up. Eight stations were identified along the course of a disused railway line. The weather turned bad at the last minute with cloud moving over, but one station was lucky. The Moon was clearly seen through a gap in the cloud and the writer timed the first DD event at 2039: 37.4s (O-C +0.52) at the -1 Sigma limit. The time was 2040 UT in the evening with the star at altitude 23 degrees. This story would not be complete without the Occult archive. I was not the only observer submitting a results. Martin Ratcliffe in the center of the graze path observed 7 contacts. I also see my name is not recorded against my own observation in Occult - also my height above MSL is incorrect (or not supplied). 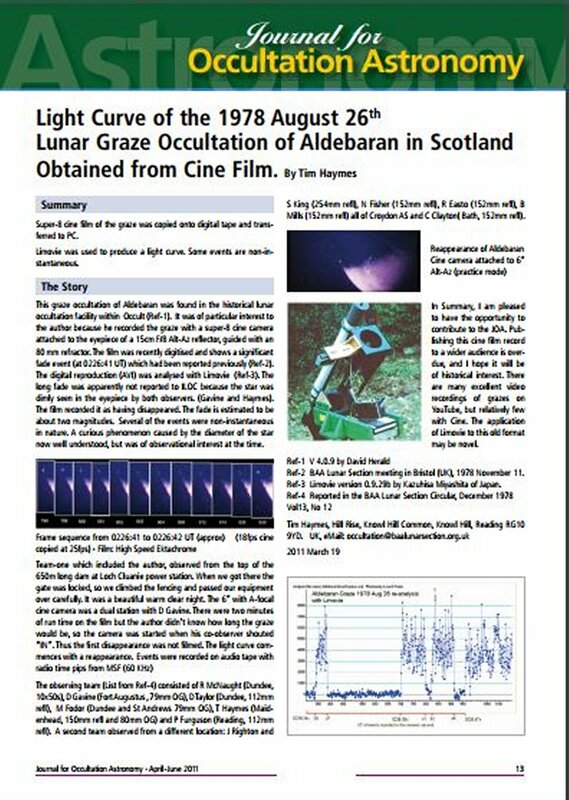 Martin Ratcliffe wrote up his report on ZC934 in TA issue 1979 June, and in the same issue, Ron Arbour describes attempts by Solant Astronomers who were clouded out at the last moment. Organised by John Trott six stations. This was the first successful graze to be reported to ILOC, who had taken over from RGO in 1980/1. For some reason I was using a 3" refractor (not my 6"). The view was quite dim by comparison. A high magnification was used (x150). I think I had to borrow the telescope and eyepiece from Don Ferguson because I arrived without any optical equipment. I was one of six teams from Reading. It was a successful expedition. Anthony Thomas (Woolhampton School) timed 11 events. I recorded 4 by tape and Radio time signal. Note: Some observes reported non-instantanious effects. Where they aware this was a known double star? My mobile 6" had been decommissioned, and the 8" was not available as a mobile instrument. 1986-11-22: Graze of Lambda Cancri (ZC1241) by Liverpool Astronomical Society. Reported by Dr.Eric Strach in The Astronomer magazine (1987 Jan), timed by Eric Jones accompanied by Murad Ghorbal (President LAS). This observation is not recorded in the IOTA database. From the TA archives scanned by NASA Astrophysical Data System E.Strach and team planned to observe but was thwarted by cloud initially, however some timings were obtained by E. Strach and E. Jones in good conditions with an 8" telescope and magnification x166. The timings are OK in a retrospective reduction using Occult 4, but there is an offset of 0.2" arc. 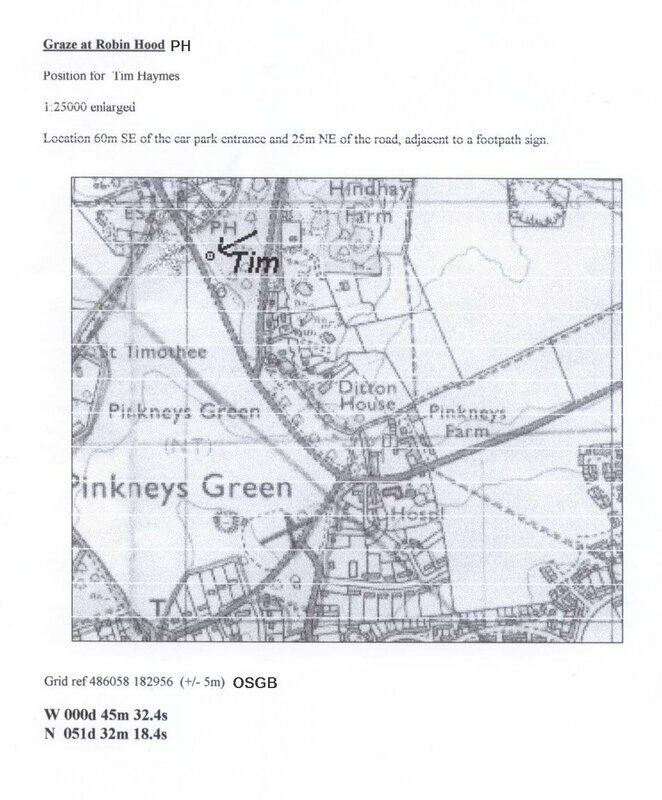 This could be caused by an error in the reported location using the Ordinance Survey (Datum OSGB36). The quality of the timings and attention to detail indicate a good set of observations. So where was the observing site? 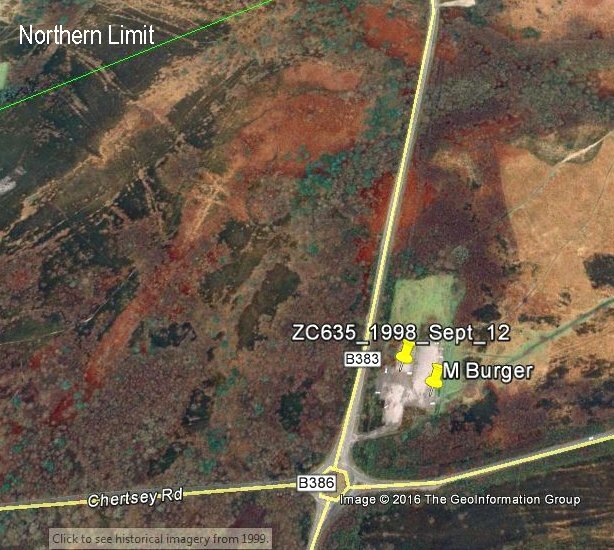 The position in the WGS84 datum (GPS / Google Earth) was obtained by entering the reported Long/Lat in "nearby.org"
The OSGB to WGS84 conversion is correct. The observer position appears to be in a field off the road which is 4.7 km inside the Northern Graze Limit and agreeing with the comment made in the report of a long disappearance followed by a few contacts. 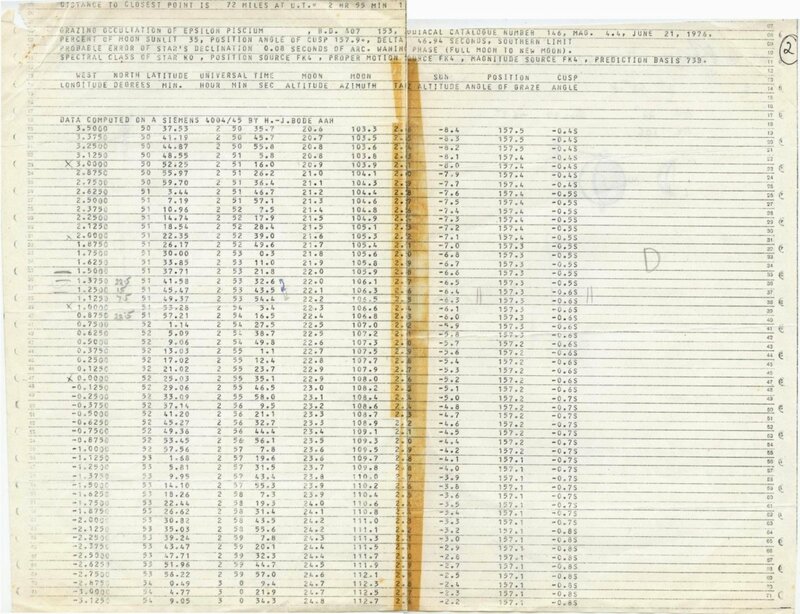 A request has been made to LAS concerning the Late E. Strach's observing log, but nothing has been located. There was only one graze predicted for the Southern UK in 1987. This was a 6.5 mag star after full Moon. Phase was -58% so the star would approach from the bright side, Northern limit. 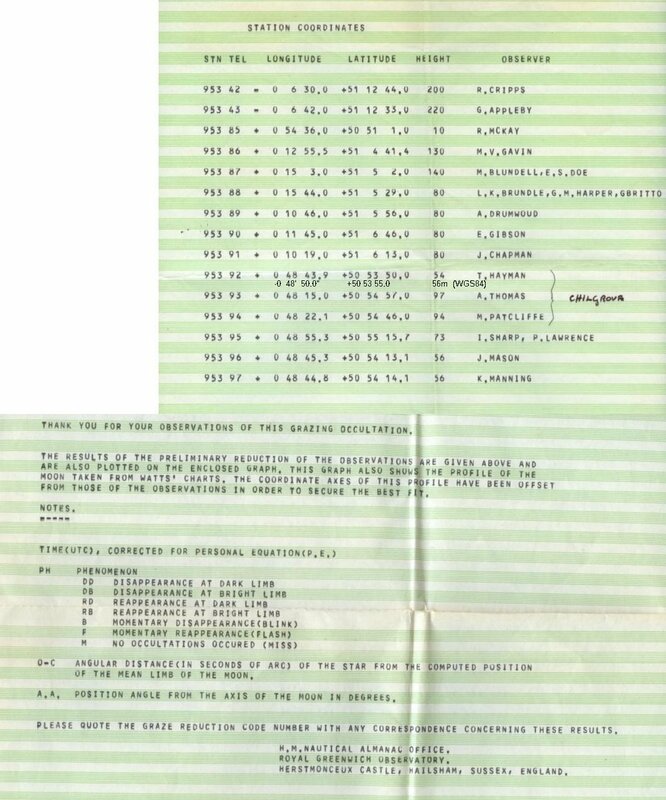 A friend of mine - Jack Smith - who was observing occultations for the JAS, had some predictions obtained from Norman Wright (JAS Occultation Director). I plotted these and found a car park on Small Dean Lane off the A4010 near Bradenham. Now that I had the use of an 8" F/6 reflector on a Fullerscope EQ mount, it was transportable and useful for graze observing. On the night of the graze I set up at 4.30 am.BST and discovered the star was double with approximately equal components in a roughly N-S orientation. The occultation from this station was of the Southern component. Two times for the South components was taken: No graze phenomena were seen. The star was hidden for 4min 42s. The event was reported in retrospect in 2017, since it was not in the Occult database. 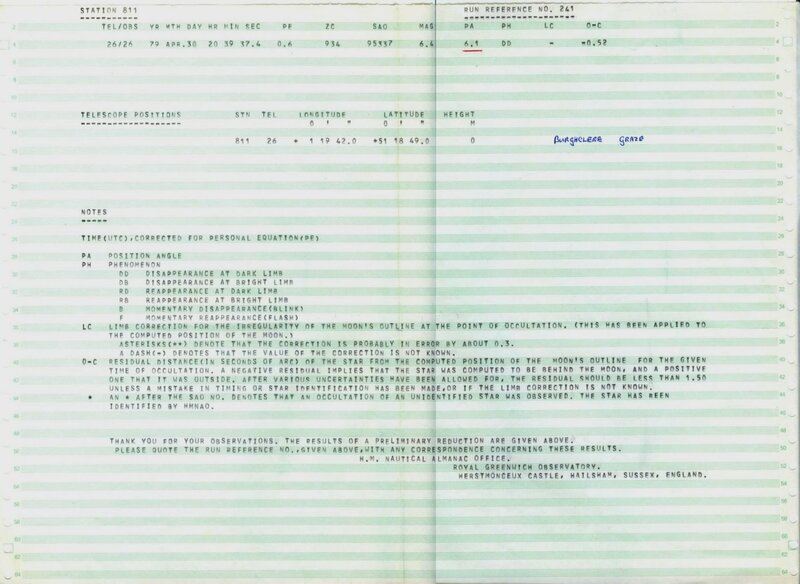 The Occult 4 reporting page was used to send a digital report, and a reduction was received within a matter of days. Timing was by audio announcement on the tape recording with continuous 1pps radio time signal (MSF Rugby). A quartz analogue clock synced to UT was used to identify the minute marker. PE was applied 1.0s. I was reading out BST on the tape for some reason. 1988-01-22: Graze of ZC3465 at Heathfield, E Sussex. J A Burger of Norwood Rd, Effigham observed this 6.5 mag star (SAO 146752) graze at the 17% illuminated Moon (S cusp), using an 8 1/2 inch F6 spec, x125. Details were reported in TA 1988-06. A short R-D of 7.8s was recorded on tape with Y3S time signal. (callsign for DIZ Germany 4523 kHz). This observation was not recorded in the IOTA database and has been re-submitted following contact with John. The WGS84 position is on a cross roads, East side. 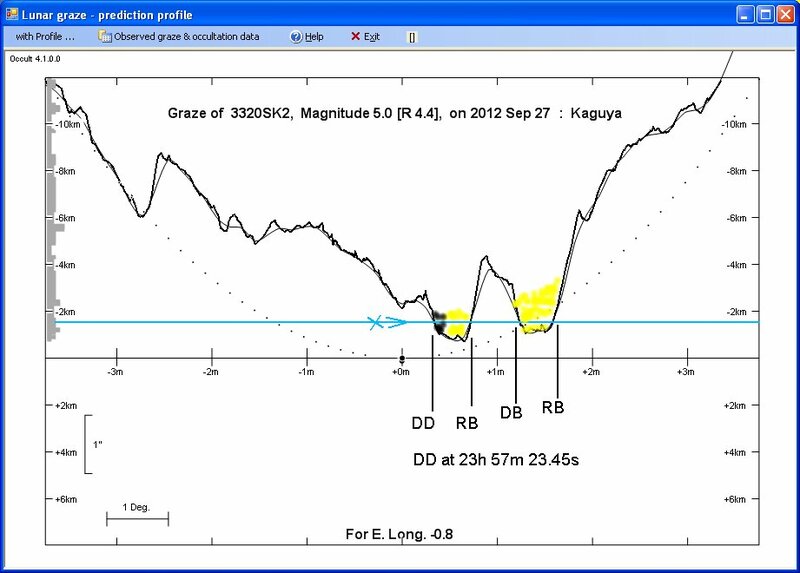 The short observed duration is consistant with being 0.5 Km South of the mean Limb shown in the re-computed profile. The stated location is "near Heathfield". This is the largest town about 2 miles to the West. 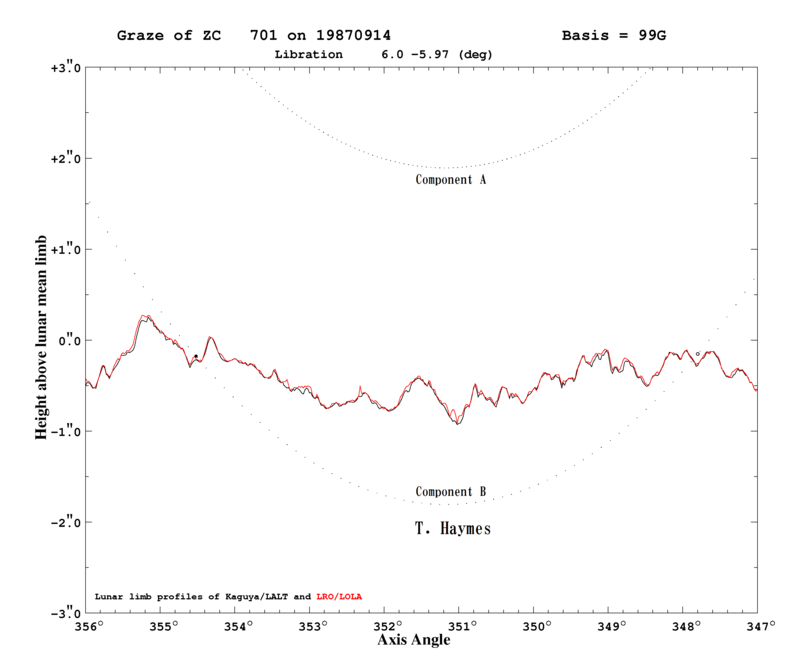 The mean residual (O-C) for the observation is +/- 0.03" arc which is well within accepted limits for this epoch. 1990-07-18:Graze of SAO76259 from Shipbourne, Kent. Organiser: Bert Carpenter, twelve stations. This was a 7th mag star close the the Pleiades, grazing the Northern Cusp at 0147 UT. The Moons Alt/Az was +15 @ 069, phase 22%, so observable. Bert was a well known enthusiast of graze occultations living in Kent. I was invited to join the team by the Andrew Elliott who had observed in Bert's graze teams on other occasions. I was at position 4. Observers were: H.Carpenter, R.Pickard, G.Bond, T.Haymes, A Thomas, A Elliott that I knew, and some others. The MO was to arrive at a meeting point using an address and OS map, and then leave in convoy, dropping observers off at predetermined locations. There was a lot of planning involved which included the distribution of information by Bert to householders in the neighbouhood, and informing the Police. Some sites were on private land with owner's permission. My location for this event was in a field opposite a remote house (or so it seemed at the time). I had 30min to set up, somewhat less than I would have liked, but this was OK for visual obs. The Instrument was a 8" F/6 Newtonian on Fullerscope Mk III EQ with manual slow motions. Timing with AudioTape and MSFcontinuous signal. Eyepiece 19mm. A PE of typically 0.5s was applied. BAA Handbook....................Dual tracks near Upton........... Limb for ZC562..................Observed profile..
Organiser: Andrew Elliott - four or five stations ? Observers: R Fleet, T Haymes, A Elliott. Instrument: 20cm F6 Newtonian on Fullerscope Mk-III mount, undriven. Eyepieces 18mm and 10mm. The magnification used for ZC 562 was x120, recording with a SHARP battery operated tape recorder and continuous time signal from Rugby 60Kz (Home made reciever). The minute marker anouncements were provided by quartz analogue clock sychronised with UT. 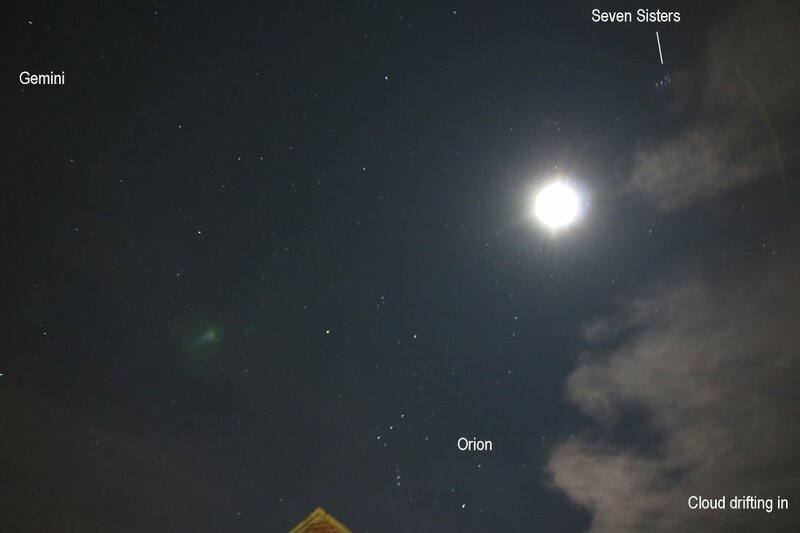 The observing site had been selected so that we could observe both grazes from the same location.The Moon was 48% at Az 220, alt 55 degrees - favourable circumstances. On the night however there were showers and a cold wind that buffeted the telescope. My instrument was set up in the driveway of Doyley Manor Farm (MAP). I recall making one observation in cloud of ZC557, but this was too uncertain in these conditions. No observations were reported for either event. (or they had been lost in transit). Addendum 2017 Oct 4 : I have found the tape recording of these observations ! This was digitised with Audacity using an *ION TAPE-2-GO tape drive; and the observations extracted. It confirms that fast moving broken cloud (gusting wind) spoiled the first graze for ZC557. The second graze was more successful and 6 contacts were recorded for ZC562 with certainty before a large cloud intervened. 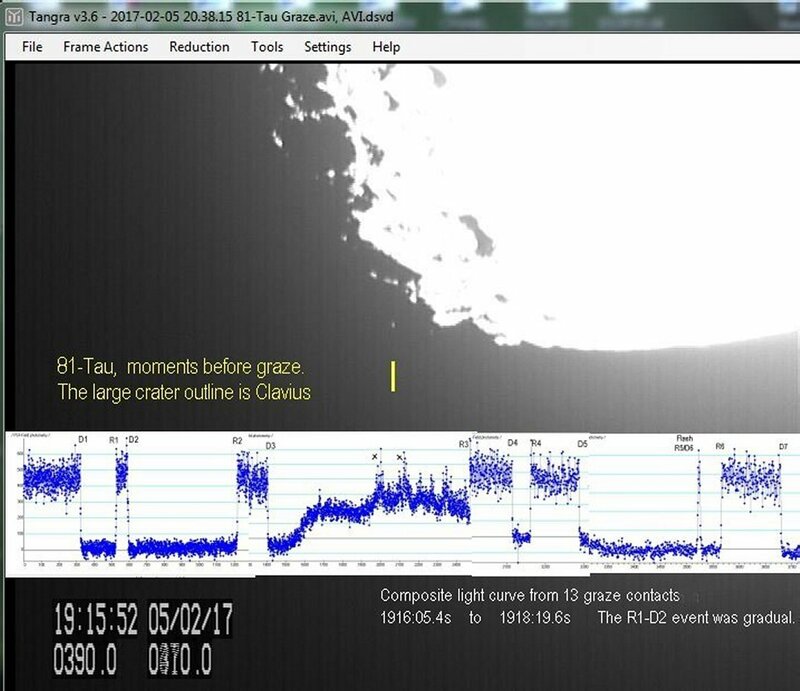 The times were extracted from the voice recording (see above) which also gave the name and locality of my observing site, for without this, the observations would have been useless. With the aid of the on-line OS maps (https://osmaps.ordnancesurvey.co.uk/51.29180,-1.44084,16) I was able to find the farm house where the telescope was set up beside the road in the Farm's driveway. The correct spelling of "Doyley" was critical. Then with Google Earth I established the exact coordinates and height. With all the info to hand i have completed a digital report for submission to IOTA graze collector in Japan, Mr M. Soma, and Dave Herald in Australia. A good ending to the mystery that sarrounded the second graze event. [ Original reports were lost ]. I arrived at about midnight and set up in the large car park. Some young drivers were using the area to do hand-break-turns, so I kept a low profile. After they had departed leaving a cloud of dust, I assembled the 8" F/6. Shortly afterwards the Police in a Panda Car arrived to check the car park and asked me if was OK and had i seen anything? I said i had, and the Police gave chase leaving me to observe. Then another car arrived and parked on the far side of the car park about 30m away. I could hear a faint beeping sound that reminded me of a 1 sec pulse!! The Instrument was a 8" F/6 Newtonian on Fullerscope Mk III EQ with manual slow motions. Timing with AudioTape and MSFcontinuous signal. Eyepiece 19mm . When my own observation was completed I walked over to investigate the faint beepinf sound, and discovered Martin Burger (Reading AS) had selected the same car park independently to observe the graze. He also reported no event. Neither of us submitted formal reports though, and my original report is lost. 80 Vir was predicted in the BAAH to be occulted by -61% Moon at Az 178, Alt 30d. The star is magnitude 5.7. The track was requested from Andrew Elliott the Lunar Section coordinator and stalwart of Reading AS. 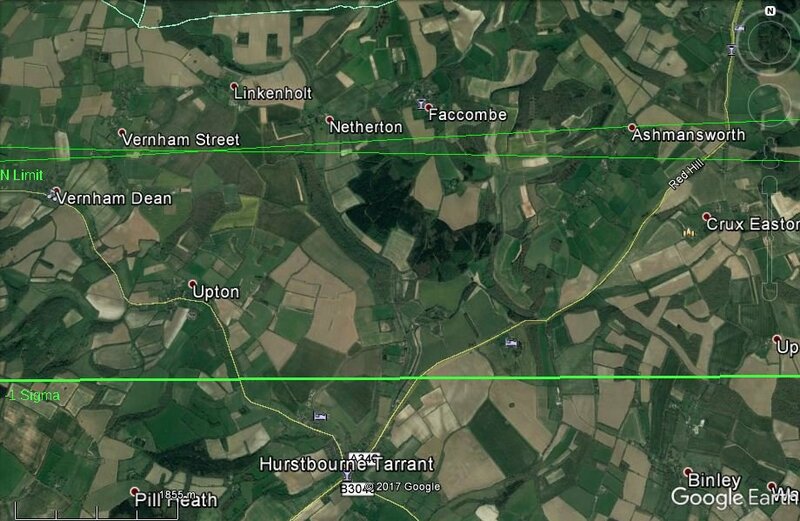 The plotted track passed close to Maidenhead and members of both Reading and Maidenhead Societies were interested in observing it, however the time was at 0500UT, a rather unsociable hour. 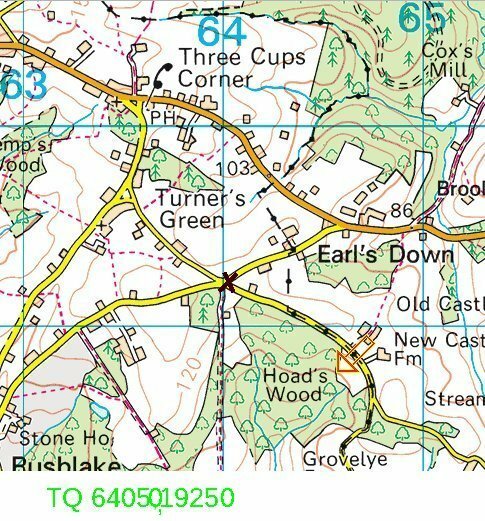 Although I had scouted out a number of locations at the Berkshire Agricultural College (I spoke to the Principal) at Burchetts Green (see map), in the end, only one observer was active and I was located near the Robin Hood Pub at the N corner of the Pinkneys Green. The Instrument was a 8" F/6 Newtonian on Fullerscope Mk III EQ with manual slow motions. Timing with AudioTape and MSFcontinuous signal. Eyepiece 19mm. A PE of 0.5s was applied. limb profile with events.........Reduction........................Video frame at the start with limb profile superimposed. I was using Occult4 to generate graze data for the BAA. The Google Earth file showed I was within the graze zone for kappa Aquari. It's very unusual for a home location to be in such a prime position. The event was successfully recorded at 2355 UT with the Moon near full (95%). Four contacts were timed, the first DD, the second RB, then two further bright limb event which were timed as best I could from the video frames. 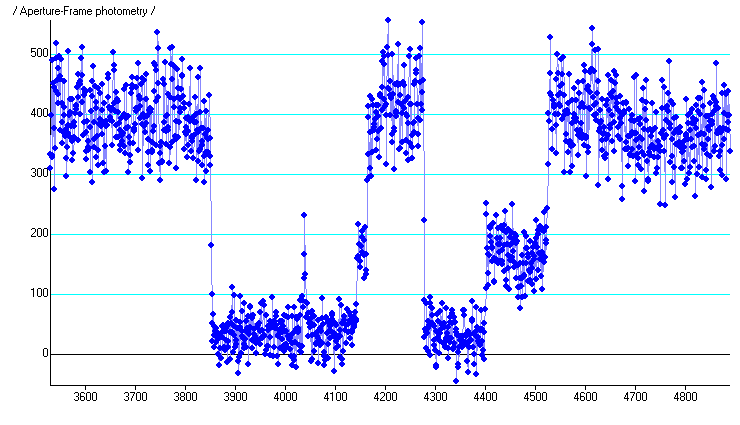 The reduction shows a large O-C for both bright limb events indicating difficult conditions for reliable times. The Instrument was a driven 30cm F/4 Newtonian and WAT-120N+ video camera operating at 25fps. The time insertion was a one-pulse per second GPS video overlay unit, the GPSBOXSPRITE2. The video was recorded on digital tape using a Sony DCR-TRV22E in its AV-in mode. The tape recording could be converted to AVI through a FireWire Express Card slot. via the import function of MovieMaker. The AVI was played back one field at a time using TANGRA software. The kappa Aqr graze was the first to be recorded with video by this UK observer. 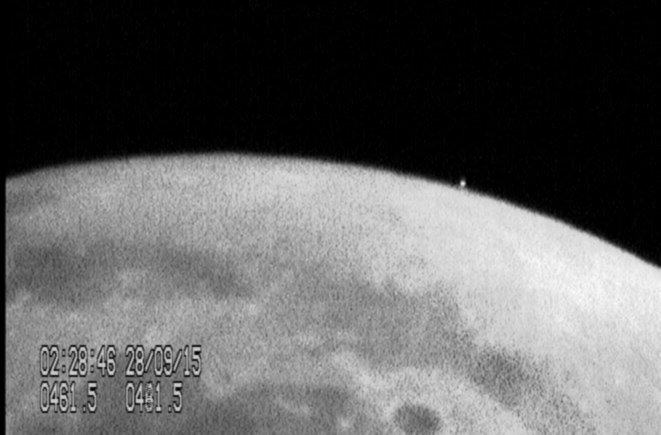 Andrew J. Elliott was the first British observer to use video to record total and graze occultations. He used a WATEC 902H (25 fps) and a Mitsubishi time and date generator (TDG). He recommended i buy the same TDG. This was a quartz crystal controlled unit that was synchronised manually to an MSF time pulse. Since there was an inevitable small time difference been the TDG and UT, this could be compensated by videoing the MSF pulse LED. 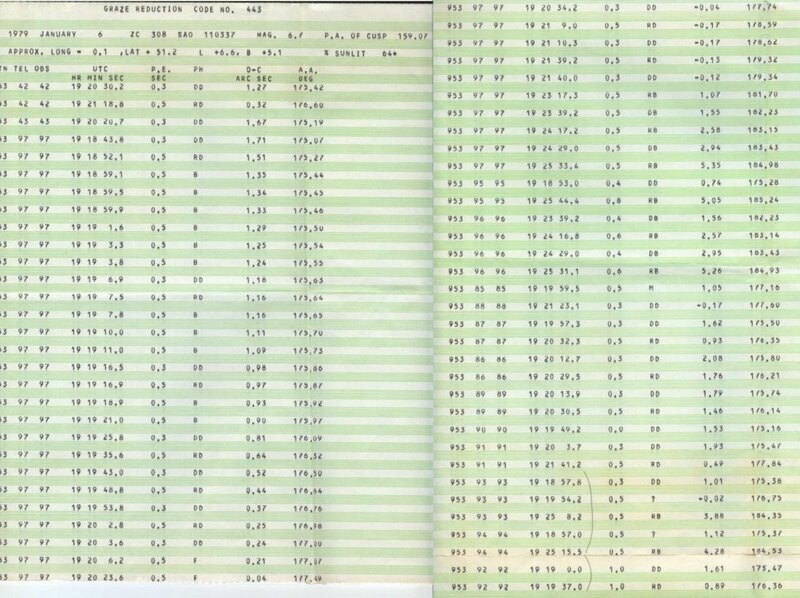 Andrew's observation of the Romney Marsh graze with Bert Carpenter (ZC 1216, 1990-April-30 ) and the graze at Shipbourne both used video with a reported accuracy of 0.2sec. 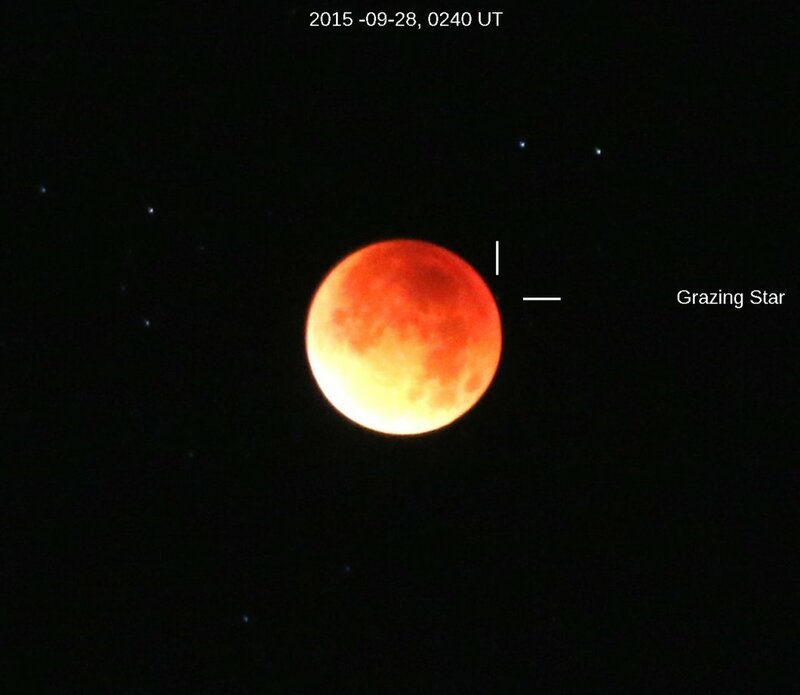 The 1990 grazes were observed by Andrew with his 25 cm SCT. Steve Ringwood and four observers recorded 6 contacts (one reappearance) in difficult conditions of poor seeing (Ant iv), bright limb(69% ill) and faint star (mag 7.2). One observer had technical problems and didn't time the event which was at 2135 UT. The cusp angle was 4.1 degrees. Details are presented in the BAA Journal: JBAA Vol 125, No1 p9 [2015 Feb] "A successful lunar graze observation by a local society". The night (early morning) was clear and the air still but with some atmospheric turbulence. Some ducks kept me company at 3am in the morning. There was danger of dew or mist ( temp was +5C) and I rushed the equatorial set up. With the Barlow in place, the Eclipsed Moon was drifting down. Not the best polar alignment. I have taken more care since. The instrument was a 203mm F/4 LXD55 with 2x Barlow and WAT-910HX at 25 fps, Gain 38dB plus the usual timing and video. Because of the dimness of the star I used a frame integration of 0.04s. (25fps) and higher gain setting. The Moon was at an elevation of 30 degrees. The DEC drift continued down, but in the end the graze was recorded before dew formed on the corrector plate. ( I had a dew shield). From the graze profile it looked as though I would see short blink through a valley.This didn't happen. 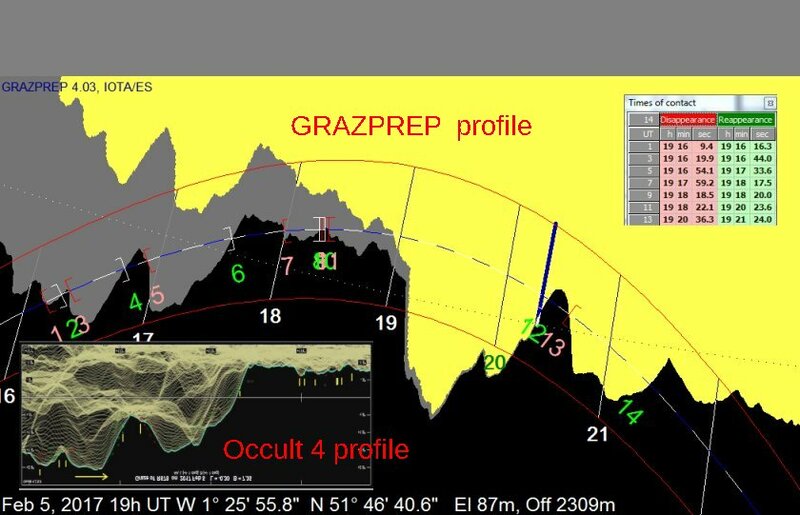 Dr.Eberhard Riedel (IOTA-ES) released a new version of his graze preparation software available here. GRAZPREP can be used to estimate the number of graze contacts at a given position in Long and Lat. The software was used for this event. Thus the village of South Leigh was found to be 2.30 Km inside the limb. I used the Church Hall car park with permission and 12 or more contacts were expected. Instrument: 203mm F/4 LXD55 with x2 ED Barlow, WAT 910HX at 50fps, gain 7dB, GPSBOXSPRITE2, and Sony TRV22E recorder. Despite a very poor forecast (100% cloud) I drove for 45 mins to the site. I was rewarded to see the cloud thinning, so I set up, and 10 min before the graze, the Moon passed into a clear patch and a recording was obtained in good conditions. The observation is reported in JBAA 2017 April (Vol 127, No.2 Page 115). Tim Haymes: Single observer position with video. The event was advertised in my local AS. This is the second graze of 2017 optimised with GRAZPREP. The Nature Center car park (Bray Wick, Maidenhead) was 1600m inside the Northern limit and 10 or 12 contacts were expected. However the most interesting aspect of this occultation was the double star involved. What would be observed? All together a most interesting event. BAA Lunar Section Occultation Coordinator.